Beloved portrait photographer Annie Leibovitz often captures celebrity subjects before her noted lens, having snapped cultural icons ranging from John Lennon and Yoko Ono to Kim Kardashian and Kanye West. Her most recent photograph, however, depicts a different sort of notable figures, those linked to the development of several life-saving vaccines. The image is part of the vaccination awareness campaign "The Art of Saving a Life (ASAL)," which, funded by the Bill and Melinda Gates Foundation, commissioned creative works from artists, writers and musicians, exhibiting the many ways vaccines have positively impacted history. The image was released at as relevant a time as ever, now that the current measles outbreak, which began in December at Disneyland, has infected over 100 people across 14 states, most of whom were not vaccinated. The disease is highly contagious, infecting approximately 90 percent of people exposed by cough or sneeze if they haven't received the vaccine. The portrait subjects from left to right on the top row are: Dr. Stanley Plotkin, developer of the rubella vaccine; Deborah Sabin whose father, Dr. Albert Sabin, developed the oral polio vaccine; Dr. Ruth Bishop led a team that isolated the rotavirus and helped to discover the vaccine; Dr. Kim Lee Sim and Dr. Stephen Hoffman are working on a new malaria vaccine; Dr. Peter Salk whose father, Dr. Jonas Salk, developed the inactivated polio vaccine; and Dr. Marc Laforce is founding director of the Meningitis Vaccine Project. 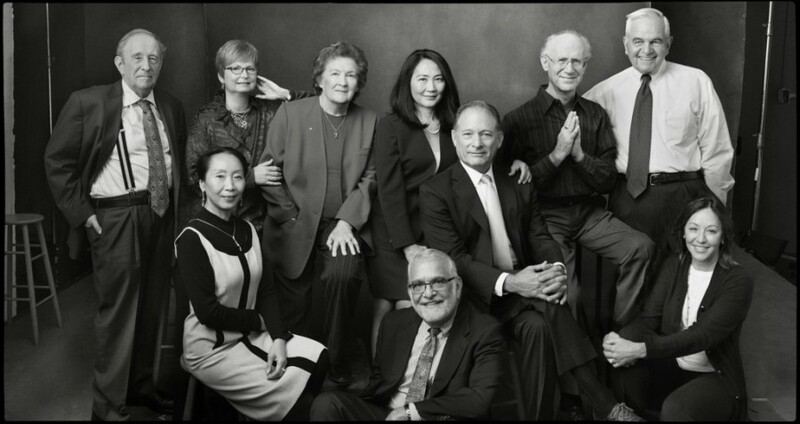 From left to right on the bottom row the subjects are: Dr. Xiao Yi-Sun whose late husband, Dr. Jian Zhou, co-developed the human papillomavirus vaccine with Dr. Ian Frazer; Dr. Peter Paradiso has worked on multiple vaccines, particularly for pneumococcal disease; and Jeryl Hilleman whose father, Dr. Maurice Hilleman, developed or perfected more than thirty vaccines, including eight used in vaccine programs around the world today. Leibovitz's photo, titled "Vaccine Heroes," shows the various men and women associated with monumental changes in the establishment of vaccines from polio to malaria. Although the vaccination debate has become a recent hot-button issue in the United States, the controversy is not directly related to the mission of ASAL, which serves mainly to reach impoverished countries where the majority of preventable deaths occur. "The places where we tend to work, the demand for vaccines is huge," Dr. Orin Levine, director of the vaccine-delivery program at the Gates Foundation, told The Wall Street Journal. "If you go to the parts of Africa that are prone to these huge epidemics of bacterial meningitis that come in waves every three to five years, and wipe out people -- normally healthy people [are] dead in two days. If you go to those types of villages, they’re not worried about the things that U.S. actresses are worried about. They’re worried about meningitis. They want that vaccine. They stand in 100-degree temperatures for hours in line to get them and their families vaccinated." "[Leibovitz's] portrait will be used in a message and that message is one of hope, it's one of encouragement, it's one of positivity," Dr. Marc Laforce said in a video behind the scenes of the shoot. "The worlds needs a dose of more justice. I can't think of anything more just than preventing death and disability." Leibovitz is one of 30 creatives enlisted to partake in The Art of Saving a Life's stunning and significant campaign. 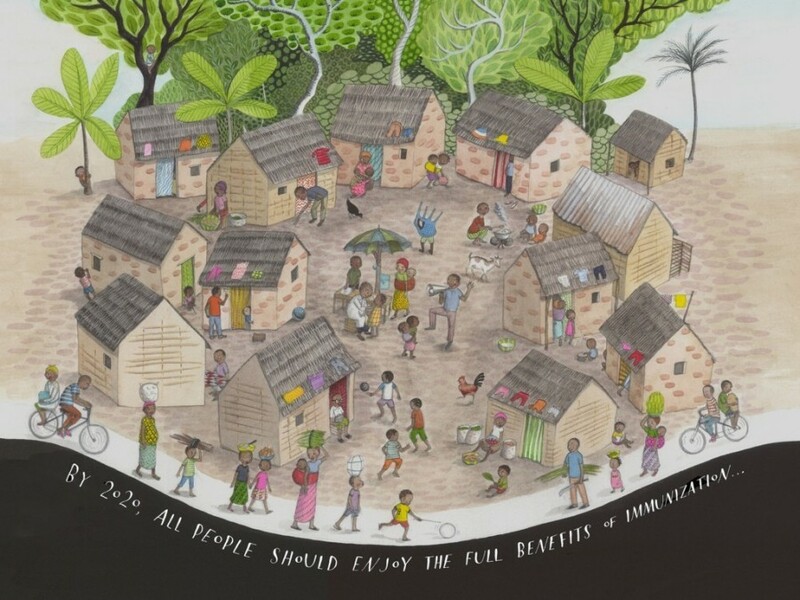 Other figures recruited include Brazilian multimedia artist Vik Muniz, Australian illustrator Sophie Blackall and Nigerian writer Chimamanda Ngozi Adichie, who drafted a fictional account of a young girl's experience in Nigeria in 1985, when free health care and vaccination was introduced to mothers and children. "A baby’s warm arm and a small injection," Adichie wrote. "It took that to save the lives of the babies born that year in my village, and in the villages around us and those far from us, in Calabar and Enugu and Kaduna. It took that to save my life." Dr. Levine explained the motivation behind the unusual art-meets-science collaboration: "I think what we do at the Gates Foundation has a really important impact on people. I think when we do our job right and well, we make a big impact on the world. And yet it’s often the kind of work that people don’t know about -- they don’t talk about, they don’t understand well. From my standpoint, I thought it was a great opportunity to try and engage art and the art community to help us spark that conversation." "I think if one person can understand the thought and work that goes into developing a vaccine and the benefit of that," Jeryl Hilleman, daughter of the measles, mumps and rubella (MMR) vaccine creator, added behind the scenes of the shoot, "if one child gets vaccinated, it was really worthwhile today." To this day, 1.5 million children die from vaccine-preventable diseases every year. That’s one child every 20 seconds. See more works from "The Art of Saving a Life" below and visit the website to learn more.